After the last post on my PDF pattern assembly troubles I don’t think it will come as a surprise that I made Kitschy Coo’s Lady Skater dress! It was intended as a muslin but I think it already turned out good enough to wear in public. 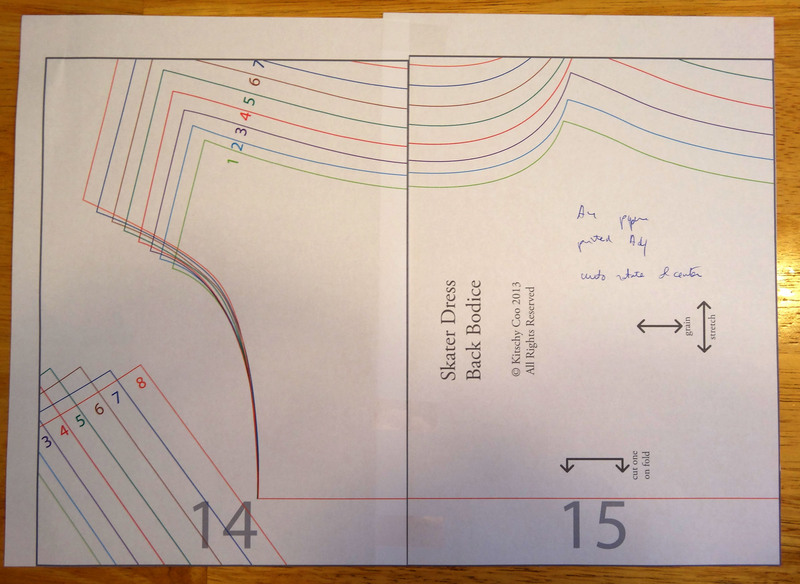 Before I go into the details of the dress I have some additional PDF information to share with you. I contacted Amanda from Kitschy Coo about my problems with the pattern assembly and she let me know that there have been more issues with correct printing of PDF sewing patterns since this summer. This is caused by an update of Adobe that throws of the accuracy of horizontal printing. If you want to know more, this website shows how to fix it. I tried it and it didn’t solve my issues (probably because my printer is crazy) but if you have problems with PDF patterns it might solve yours. If you have Windows 8 you might also have additional issues that are explained here and there you can also find how to solve these. So, onto the pattern. I intend to turn one of my UFO’s into a Lady Skater dress. This means that I have a limited amount of fabric to work with. I don’t want to turn one failure into another failure so I first made a muslin with some knitfabric that I already had. I cut size 4 with 1’’ instead of 3/8” seam allowances for the side-, shoulder- and sleeve seams. It turned out I didn’t need that extra fabric because I only took fabric away but if you want to fit a garment it is really helpful to have some extra fabric to work with. I cut off the extra fabric later on so my finished dress doesn’t have these huge seam allowances inside. 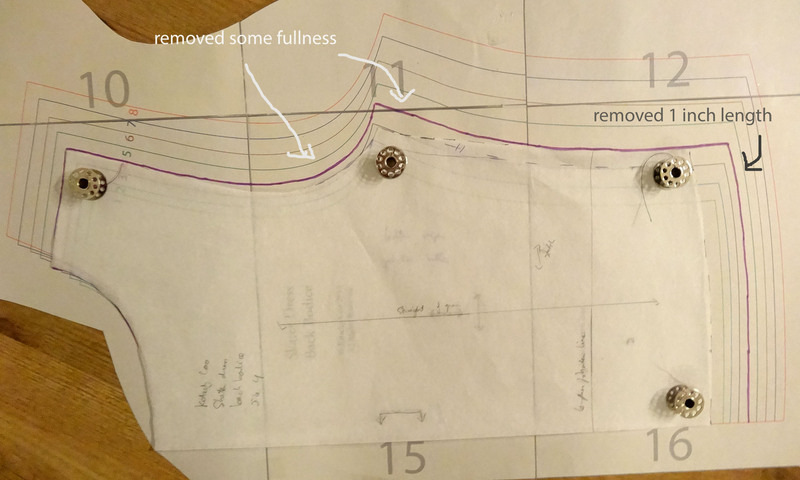 Unfortunately, I don’t have a picture of the dress without adjustments but in the pictures below you can see what my adjusted pattern pieces look like compared to the original pattern. I have highlighted size 4 of the original pattern in purple. I left the skirt, neckline band and sleeve bands unchanged. The main fitting issue was that there was a lot of excess fabric around the sleevecap that created unsightly folds at the seams and around my upper arm. I got rid of these by removing some fabric. I wanted the skirt to hit closer to my natural waist so I chopped 1” off the bodice. There was some excess fabric around the armhole and the sideseams so I removed some fullness there. I think I removed a little too much because the back is now a bit too tight so I am going to add something in the next version. Chopped off 1” of length of bodice and removed some fullness at the side seams and around the armhole. Removed some fullness around the sleevecap and at the upperarm. I now have quite an oddly shaped sleeve pattern but the fit is much better. Perhaps I have oddly shaped arms? Instructions are clear, I didn’t use them that much, but for a beginner sewer I think they will be a great help. Very clear which line on the pattern belongs to which size because they are different colours. If you don’t have a colour printer I suppose this would be something that you won’t like about the pattern. The shape of the neckline. 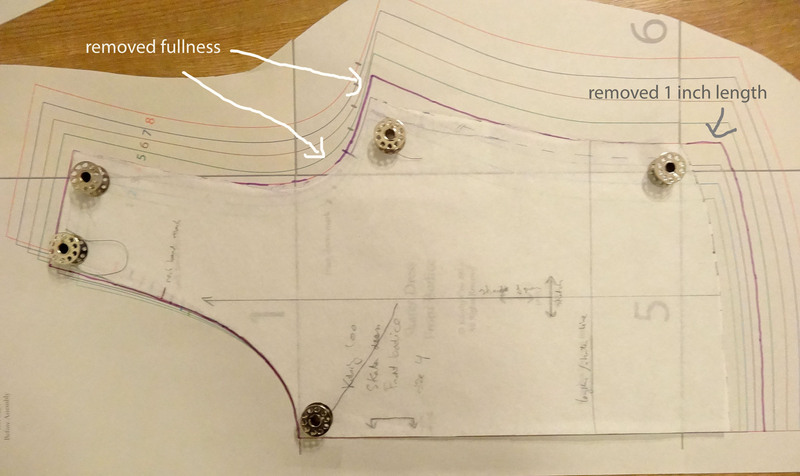 Clear elastic is added to the waistline seam allowance, this helps to keep the dress in shape. Good customer service. Not only with the PDF issues but I also completely overlooked that there was a download link after you pay for the pattern so I waited for it to arrive via e-mail which of course didn’t happen. Amanda e-mailed me the pattern very quickly after I enquired when I could expect the pattern to arrive. So, if you buy this pattern, there is a download link! The straight of grain line on the sleeve is tiny. I like them to be long. It is easy to fix this myself but, well, why not make it large on the pattern? I had issues printing it correctly but I suspect this was mostly due to the printer and not the pattern. I think I’ll get rid of the sleeve bands by making the sleeve a bit longer. I don’t really like a sleeve band on ¾ sleeves. I think it is less comfortable than a turned over hem. 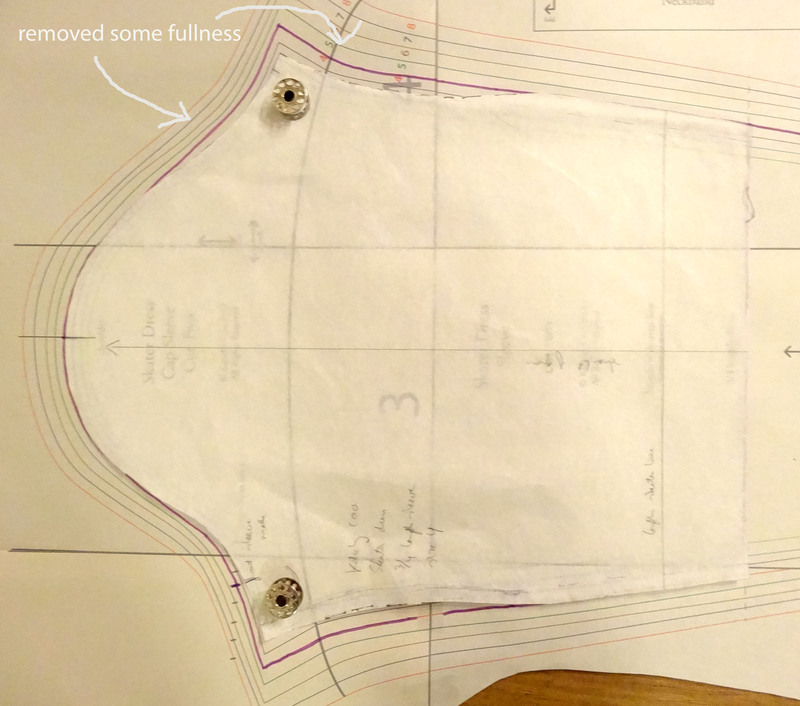 Make some small adjustments to make the bodice fit even better. Perhaps raise the bodice by another ½’’. Overall, I am very happy with this pattern and I hope to show you my next version soon! 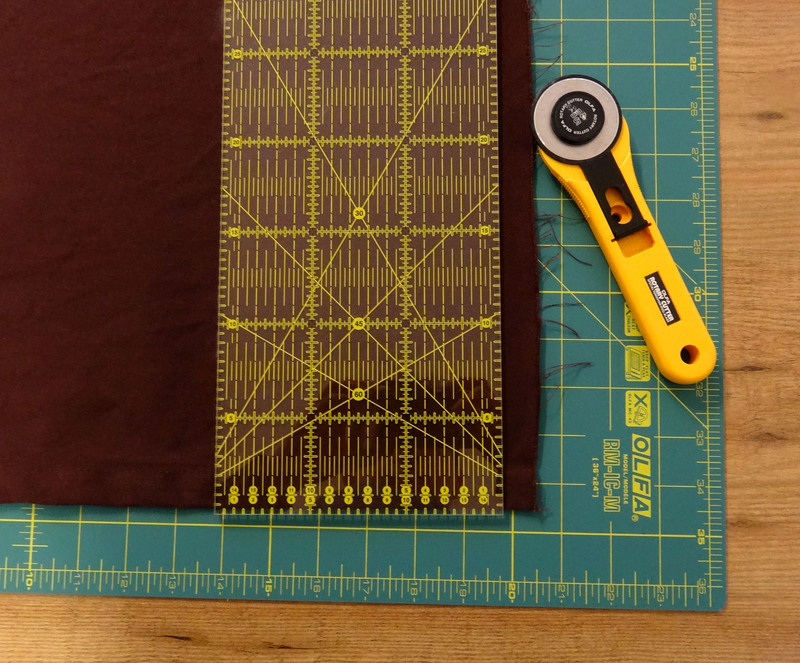 Did you, like me, believe that if the test square on a PDF sewing pattern prints correctly your PDF sewing pattern will also print correctly and you should be able to assemble the pattern without trouble? You are wrong. This story began when I decided that I wanted to make the Lady Skater Dress from Kitschy Coo. I’ve seen many great versions popping up and I think there is a good chance that this dress will look good on my body shape so I bought the pattern a couple of months ago. This week I decided it was time to get started. The printed test square was exactly 1’’ so I eagerly started the assembly process. Things did not go well. Lines did not match up. Yes, I did follow the instructions for printing the pattern. I made sure the scaling was set at none and that the auto-rotate and centre box was ticked. Tiles 14 and 15 (back bodice) are a good example of my issues. The grey rectangles that surround each tile are not the same size and when I matched up the centre back on the two tiles, the armholes were completely off. In this case they are off by 1/8”. It drove me nuts because this was obviously not going to work. Auto-rotate and centre turned on. The two tiles are off by 1/8” making it impossible to correctly assemble the pattern. I could of course have thought “this pattern is just not good, move on and make something else” but I was not yet ready to do this. I had trouble believing that every person that had blogged happily about how great this dress is had encountered this same problem. My boyfriend suggested that perhaps the auto-rotate and centre option was the problem. I thought he could have a point because I have also used PDF patterns where they specifically tell you to turn this option off. Those patterns, however, have white space around the tiles in the PDF. In this pattern the edge of the PDF page for each pattern tile is the grey rectangle. If you do not tick the auto-rotate and centre option some of the pattern will not print (see picture below). However, when I turned it off, the alignment of the lines improved significantly. So, I definitely think this printer setting might be part of the issue. At least for my printer, which is an HP Officejet 6700 Premium, I think checking this option does result in some sort of scaling despite having ticked the no scaling option as well. Auto-rotate and centre turned off. The lines align better, but part of the pattern is not printed. Then I mistakenly thought that this is a US pattern (it’s not, it’s British). In the US they don’t use A4, they use Letter sized paper. What will happen if I set the page settings while I am printing to Letter and also use my foundation paper piecing paper that is also Letter size? Suddenly my lines matched up! Hey, now my lines are suddenly a pretty good match! I didn’t really want to use my foundation paper piecing paper to print PDF sewing patterns because it is much more expensive than regular printer paper. I printed the same tiles a 4th time, but now with the printer page settings on Letter, while printing on A4 paper. This was certainly a huge improvement from having the printer settings on A4, but the lines were still a little off, not as much though as when the page settings were on A4. Definitely better than when the printer is set on A4 but still the lines don’t quite match up. Does this story have a happy ending? Yes, I printed the entire pattern on my foundation paper piecing paper with the printer page settings on Letter. 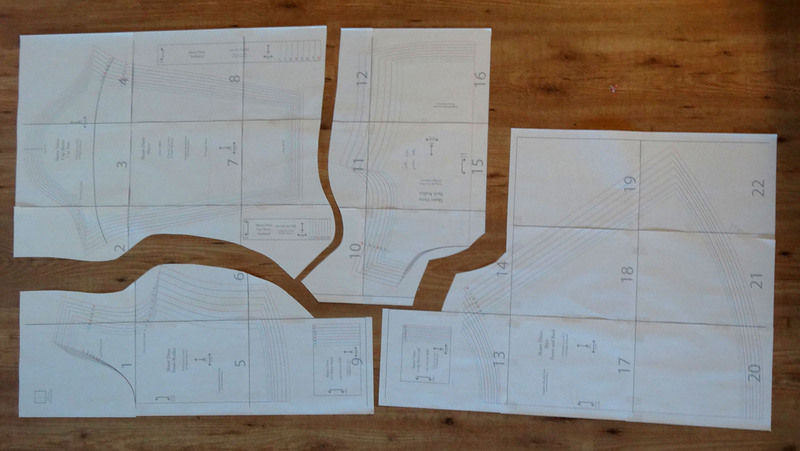 The pattern assembled in a breeze and I am now ready to trace the pattern pieces in my size and cut them out of fabric. The weird thing is though, when I tried to print these pages again with printer page setting on Letter and Letter sized paper the result was similar to when I used page settings letter and A4 sized paper, again I had some trouble aligning them perfectly. I suspect this printer is trying to mess with my head. I figured I might not be the only person who from time to time struggles with PDF sewing pattern assembly and thought that this information on how changing the printer page settings can help fix some problems might be useful. I am a little baffled though how changing this setting could have this effect. If anyone has any suggestions I’d like to hear them! 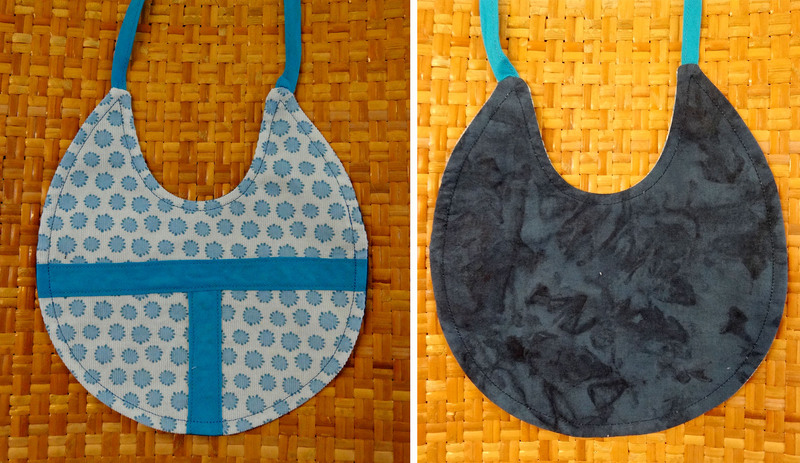 I needed something fast and simple and chose bibs because I hadn’t made bibs in a while. Since the babies are already here I personalised the fronts with their initials (being late does have some advantages). 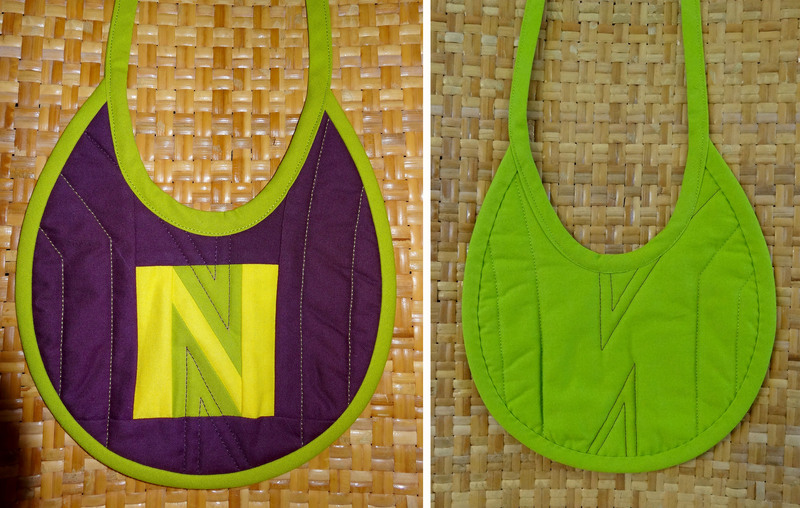 To make it perfect, each child has a different initial so I had every reason to make 3 completely different bibs! I don’t like making exactly the same thing over and over again because that turns sewing into a chore. No 1: Corduroy front with cotton applique, cotton back and bias tape straps. 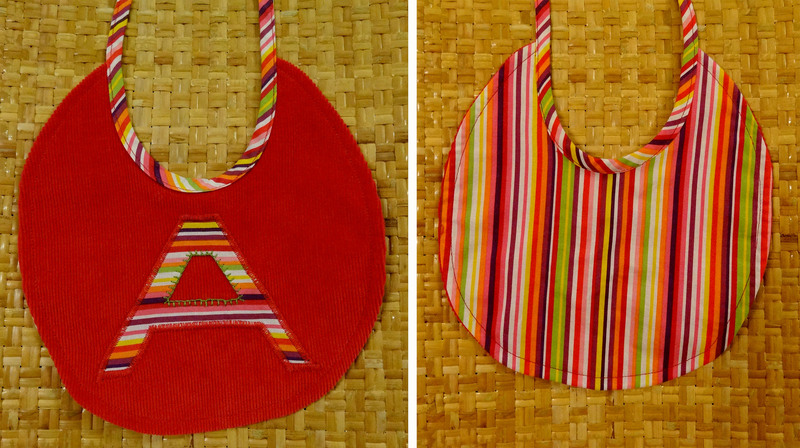 The outside of the letter is appliqued with a machine zig zag stitch. The inside is hand-embroidered with the blanket stitch. This was a happy accident because I didn’t notice I had forgotten to do that part of the letter until after I had sewn everything else. I think it adds a nice touch. No 2: Self-drafted foundation paper pieced front, Kona cotton and Hobbs 80/20 batting. The bib is quilted and finished with bias tape binding and strap. Yes, I was going for fast & simple and then decided to make my own paper piecing pattern and quilted the bib, I accept that this probably only makes sense to me. This bib is definitely my favourite, I just love this colour combination. No 3: By this time I was getting bored with attaching bias tape so I used a different method to attach the straps which didn’t turn out perfect but it does the job. I’ve always called this babyrib fabric “the Coronovirus fabric” because the shapes on the front are exactly what you see when you look at Coronaviruses with an electron microscope. I am hoping the baby’s mom will notice this as well. What are your favourite baby gifts to make? If you have children of your own, what were the favourite hand-made gifts you received? No UFO this time, but some house shoes that I really needed because I could see my right foot through the sole of my old pair. 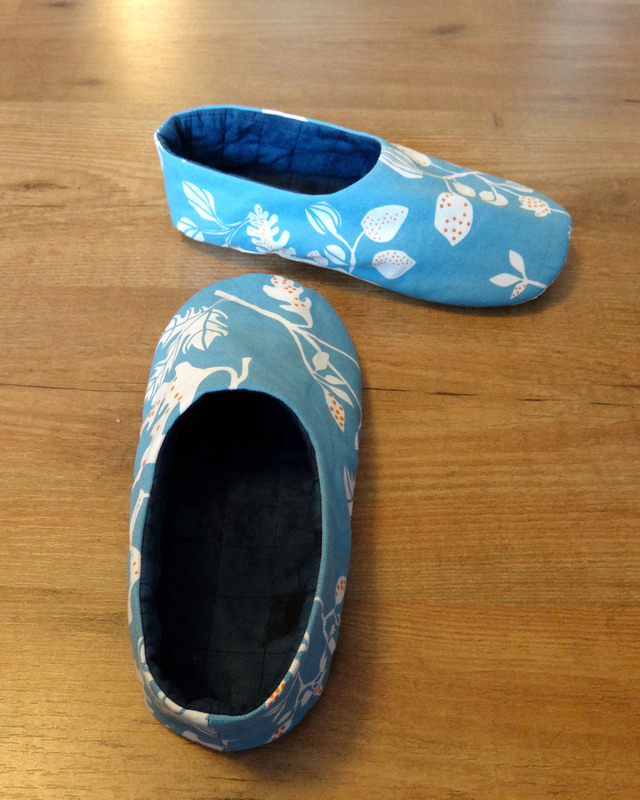 I used the Samantha Women’s shoes pattern from ithinksew. I think they turned out very nice and I’ve already put my old pair in the bin. Instead of interfacing the outside layer I chose to quilt the lining, because I figured “if you want warm feet why not wrap them in a quilt?”. I think this worked out fine and makes the inside look pretty as well. I simply basted a layer of cotton (you might recognize it as a remnant from this blouse) and a piece of Hobbs Heirloom wool batting and quilted a 1’’ grid. 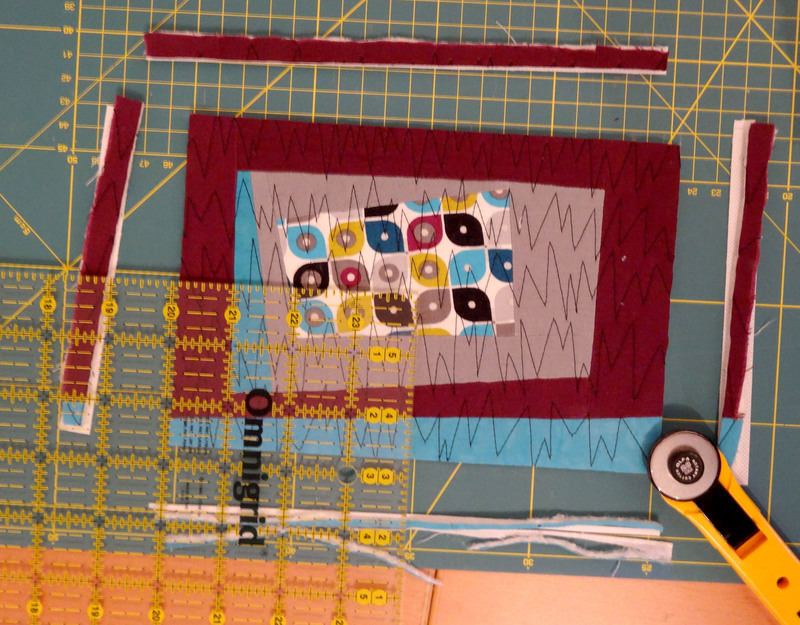 Then cut out the pattern pieces for the lining from the quilted fabric and followed the construction instructions. The outside was made from a remnant of home decor fabric from IKEA. I think it would also be great to quilt the outside upper pieces with the quilt as you go method to create a scrappy look. If I make them again I think I’ll give that a try. For the outside sole piece I decided to use slipper grippers. This is a sturdy fabric that has little feet of non-skid material printed on it. The feet come in different colours, but sadly the fabric is always the same unbleached cotton colour. Using non-skid materials for the outside sole is recommended in the instructions but in my opinion this is non-negotiable. I don’t like slipping and sliding down the stairs and if you only use fabric for the sole the risk of slipping is huge. The instructions are very clear and the pictures are very informative. The construction method is clever; the inside of the shoe looks just as clean as the outside. It is an easy to make pattern with only 2 different pattern pieces and, especially if you don’t add quilting like I did, it can be a very quick make. 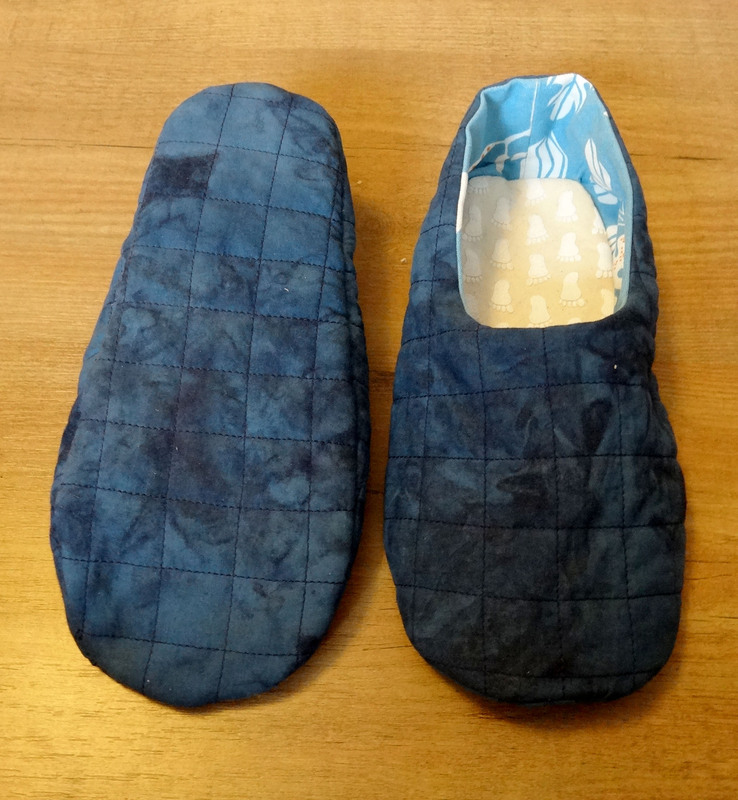 The instructions recommend that you interface the exterior fabric with fusible fleece, which I find a very good idea since I think most people would make these shoes in order to have warm feet. The samples that they show of the pattern are, however, not interfaced. I felt a bit cheated when I read this in the instructions. Interfacing, and especially a thick one like fusible fleece, is going to affect the look of the finished product. If you compare my shoes to the ones that are shown on the pattern you’ll notice that mine look much bulkier. The straight of grain line on the pattern pieces is only ½’’, which I think is too short. This is only a minor annoyance because I can easily extend the line myself but I don’t think I should have to. I think I’ll make a size in between 8 and 9, to give my toes a little bit more room. 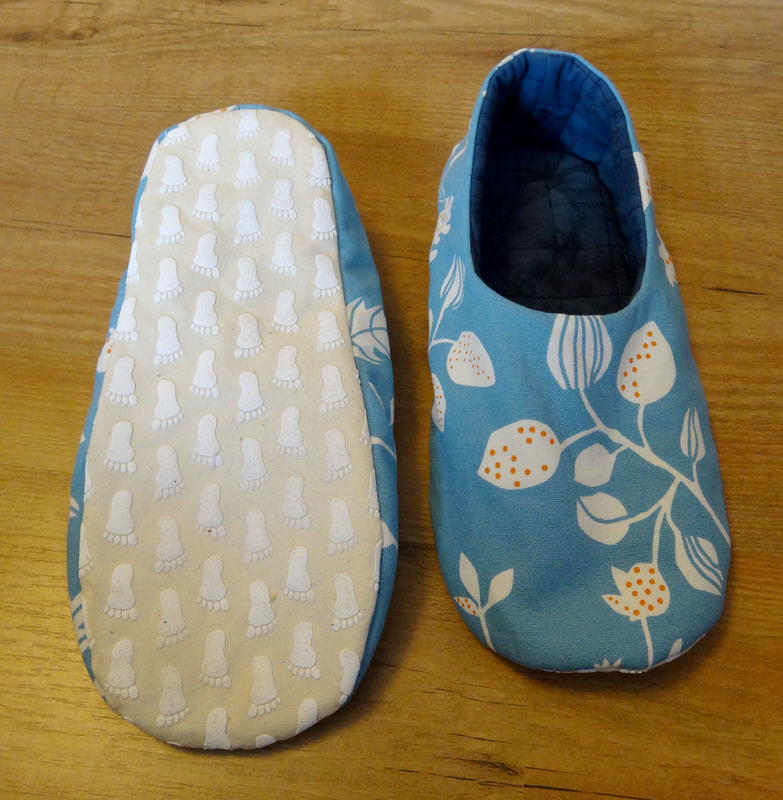 Make the sole a bit thicker, for example by using fusible fleece for the sole instead of batting. Perhaps use a different kind of batting or 2 layers to make them even warmer. US shoe sizes are very different from European sizes which I discovered when I printed size 5, held the sole piece up against my foot and realised that it was much too short. Eventually I ended up making size 8. 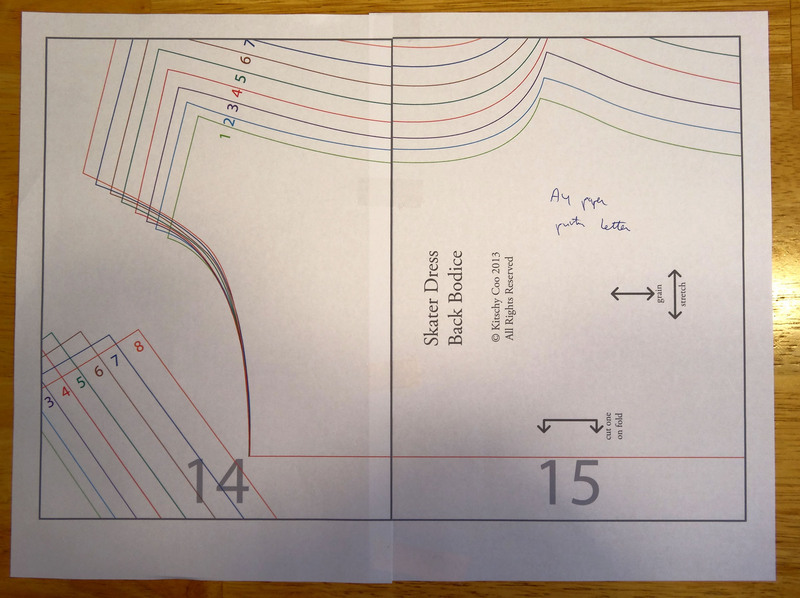 This pattern only goes up to size 10, some of the other ithinksew shoe patterns go up to size 12. 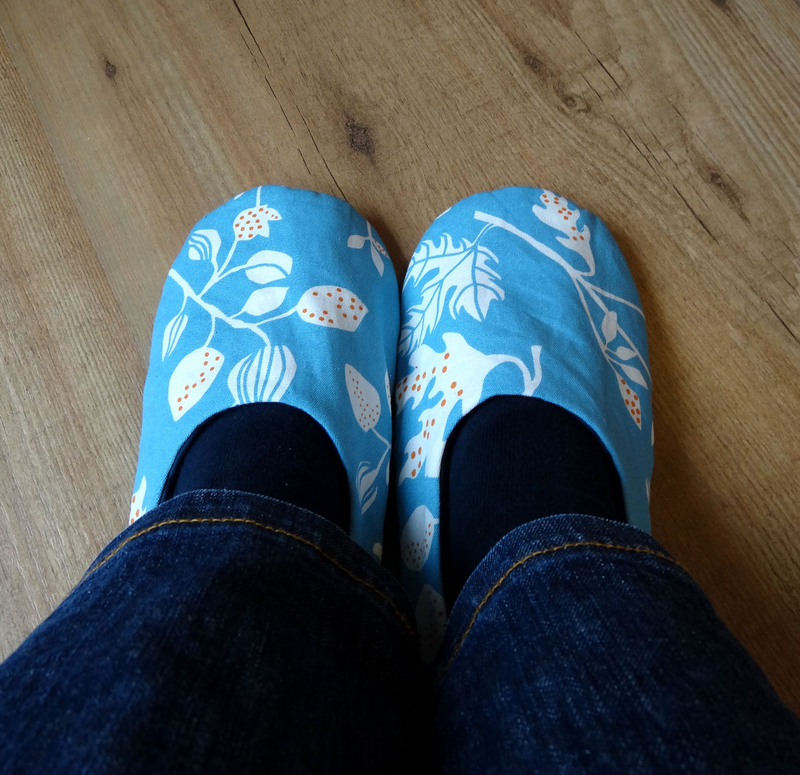 If you have large feet I think it is advisable to check your US shoe size before buying a pattern. I used this conversion chart. The pattern is made for Letter sized paper. A small corner of the upper piece for size 9 wasn’t printed (but could easily be fixed by extending the lines) when I used A4 paper. For size 10 I suppose more of the pattern might end up unprinted. Yes, it is true, I have finally busted my most glaring UFO. After 2 years in our current home we no longer have a living room with 3 unhemmed curtains, no, we have a living room with 4 hemmed curtains! No more missing curtains, no more raw uneven edges, no more linings that peep out from under the curtain. It is a weight of my shoulders and to be honest, I’m still having some trouble believing it myself. That curtain on the left used to live in one of my closets. Why did it take so long? Well, I just didn’t enjoy this project at all. I wanted these curtains to add warmth to our living room since we live in a house that certainly didn’t have good insulation as a requirement when it was build so I chose a thick fabric for the curtains and added another thick layer of insulating lining. This made the curtains very heavy and a real chore to work with. On top of that, I had to clear (and clean) the living room floor each time I worked on them because I needed a very large surface to lay them out. Sewing should be fun and these curtains most definitely didn’t count as fun. In the end I managed to complete them because my boyfriend (who started to get somewhat annoyed at the missing 4th curtain) helped out. Having someone else carry them each time they needed to be moved from the curtain rail to the floor, to the sewing machine, back to the floor, etc. and who helped with the fabric manipulation and made sure they didn’t slip off the table while sewing made a huge difference. Wait… is that… a hem? Are there no positives at all to this project? 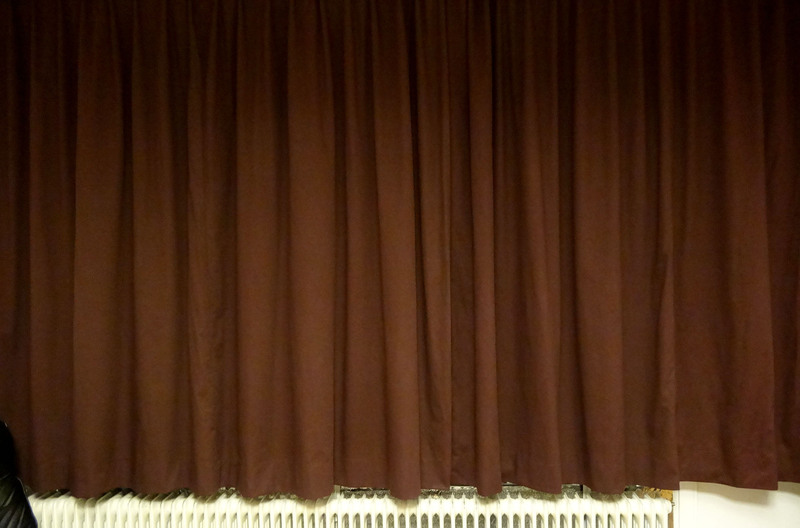 Well, I really like the brown/purple colour of the curtains (the colour doesn’t show very well in these very dark pictures) and we did get to play with my skirt marker, or as we really prefer its much cooler German name, my Rockabrunder. I also think that my attempt at adding insulation through the curtains did work. 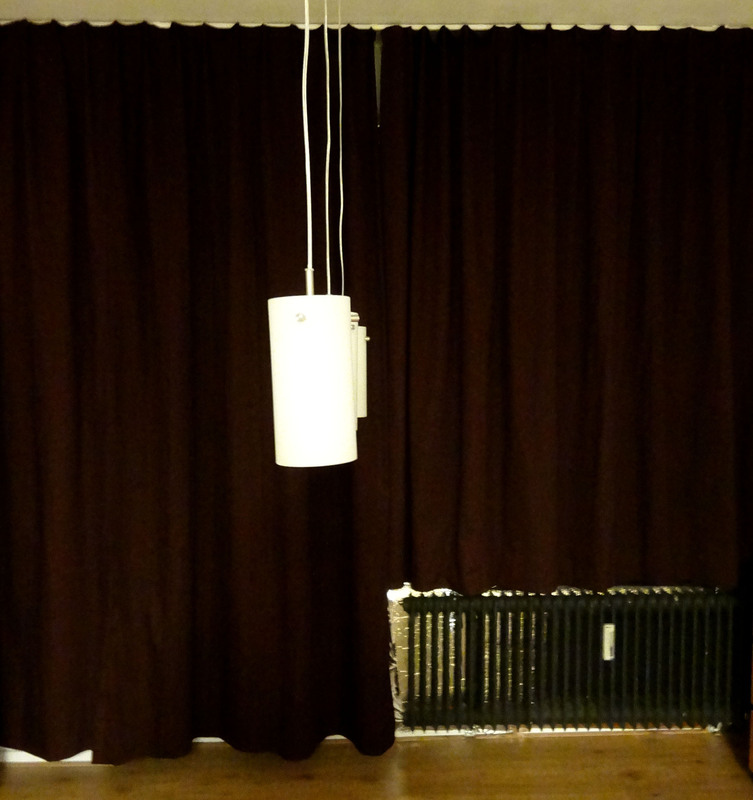 Only now my boyfriend is worried that the weight of the curtains will bring the curtain rails down. We’ll see. This project made me realise that just because you can make something yourself this doesn’t mean that you have to make it yourself. It is a bit like making fresh pasta. Sure, you can do that, and it sounds very appealing, but do you ever make fresh pasta? 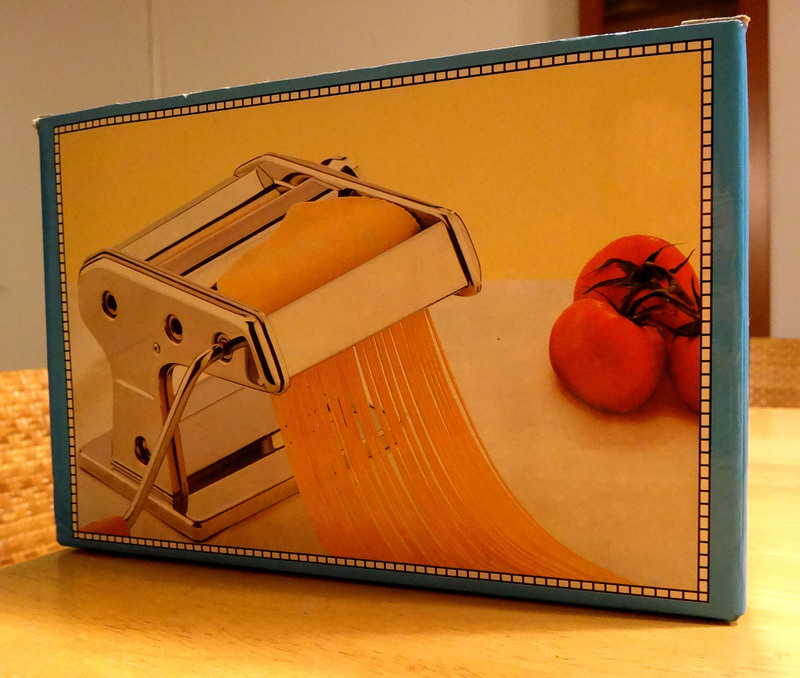 Like many households we own a pasta machine and like 99% of the owners of a pasta machine we’ve used it maybe twice in the 5 or 6 years that we’ve had it. The thing is, contrary to what some tv chefs want you to believe, you do not whip up a fresh pasta dish in 5 minutes. I usually use dry pasta and when I want something a little more special I’ll get the fresh pasta that they sell in the supermarket, because that already tastes pretty good, right? (Although, how fresh is something that you can store in the fridge for 2 months?) Anyway, the thing is, I don’t bother to make fresh pasta myself because I can buy a pretty decent quality and this is going to be my attitude with curtains from now on. Why bother to make them when you can buy them. My future home decorating efforts will focus on pillows and quilts (just don’t expect anything king sized..). So, dear friends and family, if you ever need new curtains, don’t come to me. I’m not even going to offer to help you make them yourself, that’s how much I didn’t like it. Although, I suppose, if you’re nice I might let you borrow my Rockabrunder because it was pretty helpful. 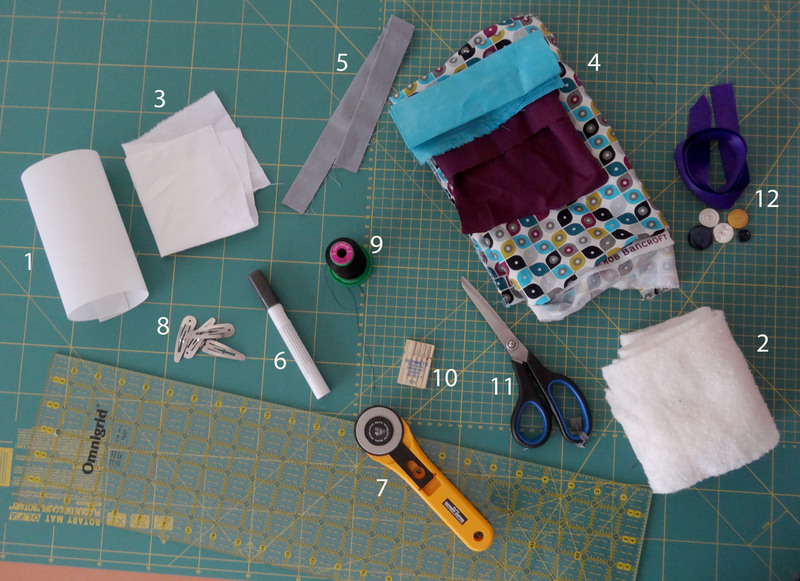 As promised a follow-up post on my fabric postcard tutorial. Today I show you how to make quilted postcards. 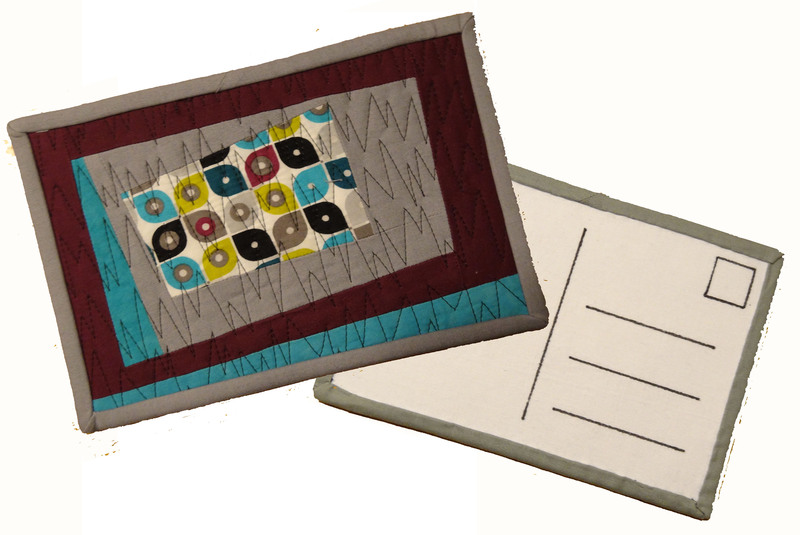 The procedure is quite similar to how I made the regular fabric postcards but there are some changes. Firm iron on interfacing such as Vilene/Vlieseline s520 or Pellon’s Peltex #71F (I’ve also seen it being called Vilene ultra firm fusible and Decofix). You really want to use this very firm/stiff interfacing because it gives the finished postcard a real postcard look and feel. Optional: buttons, ribbons, trims, beads, embroidery thread etc. I chose to make my postcard for this tutorial 5’’x8’’ (12.5×20 cm) which is larger than most postcards, but I find it too fiddly to attach binding to something smaller. Make sure that your piece of fabric (pieced or not) is a little larger than the finished postcard size (5.5’’x 8.5’’ in my example) and baste it to some batting that is again slightly larger than your fabric. You don’t need to add a backing. Quilt as desired. After you finish the quilting trim off the excess batting. Cut the firm iron on interfacing and the white cotton fabric for the back a little bit larger than the finished size of the postcard. I’m making a 5’’x8’’ postcard so I cut mine approximately 5.5’’x8.5’’. Use your iron and a little steam to fuse the interfacing to the white cotton. Place your postcard front and back on top of each other, wrong sides together. Use the cutting mat, ruler and rotary cutter to cut the postcard to size. By cutting the front and back of the postcard at the same time you will ensure that they will fit perfectly during the assembly step of the postcard. Add further embellishments to the front of your postcard. Use buttons, ribbons, trims, decorative stitches, embroidery floss, etc. Be creative, but keep in mind that you will add a binding so do not place buttons or other very bulky things too close to the edge. 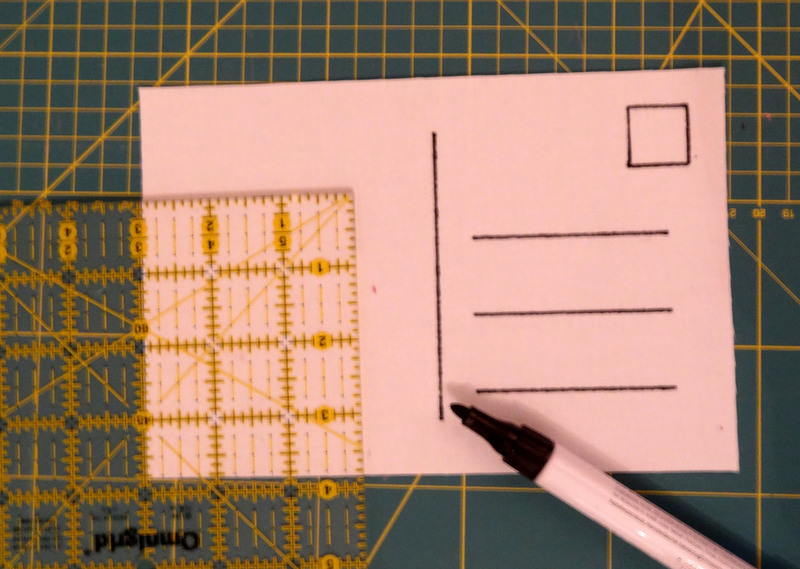 Use the ruler and waterproof marker to draw the distinctive postcard markings on the back. Alternatively, you could also “draw” these lines with a stitch line, but I prefer to draw the lines with a marker. Keep in mind that you don’t want to cover your drawings with the binding. If you keep at least 1/2’’ away from the edge you should be fine. If you added a lot of bulky things like buttons, now would also be a great moment to write your message on the back of the postcard because the bulk on the front will make it significantly more difficult to do this once the postcard has been assembled. Again, leave enough of a margin because the binding will cover the edges! Put the front and back of the postcard wrong sides together. I like to keep the two layers together with quilting clips because pins don’t work very well with the very stiff interfacing. If you want to finish your postcard really quickly you can use the zigzag stitch finish that I showed in my previous tutorial. One thing you’ll have to look out for though is that the fabric edge of the quilted layer stays aligned with the back, I find that it wants to shift more than when the front is not quilted. The finish that I prefer, but which definitely takes more time, is to bind the edges of the postcard with a piece of binding. This turns it into a real mini-quilt. I prefer the look of a hand sewn binding, so that is what I am going to show you. But if you like to attach your binding completely by machine that is of course also an option. Cut a 2’’ wide binding strip that is long enough to encase all edges of the postcard. My postcard is 2×5’’ + 2×8’’= 26’’. To make sure I had enough binding I cut a strip that was longer than 34’’. The strip should be cut on the straight of grain. Fold the binding strip in half lengthwise and press with your iron. You want to start on one of the long edges on the front of postcard. Align the raw edge of your folded binding strip with the edge of the postcard. I don’t pin the binding in place but keep it aligned with my hands while sewing. 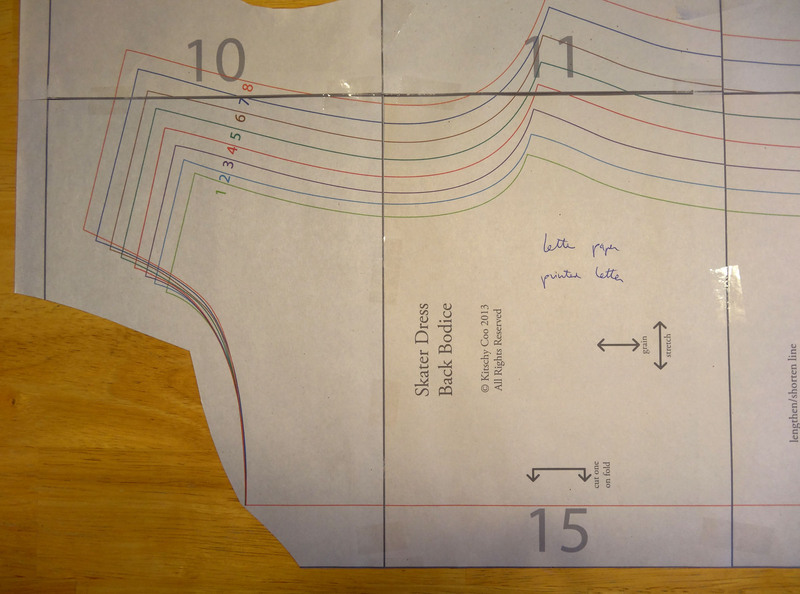 Start sewing with a ¼ inch seam about ¾ inch from the corner, don’t forget to backstitch. Make sure that you leave at least 4’’ – 5” of the binding strip trailing off so you’ll have enough to work with when attaching the two ends of binding later on. Stop sewing ¼ inch from the corner, take some backstitches to secure. Take the needle out of the fabric, and pull the postcard out of the machine (if you only pull it out a little bit it won’t be necessary to cut the threads). To create a mitered corner the binding strip is first folded upwards and then downwards so that the second fold aligns with the horizontal part of the binding strip. 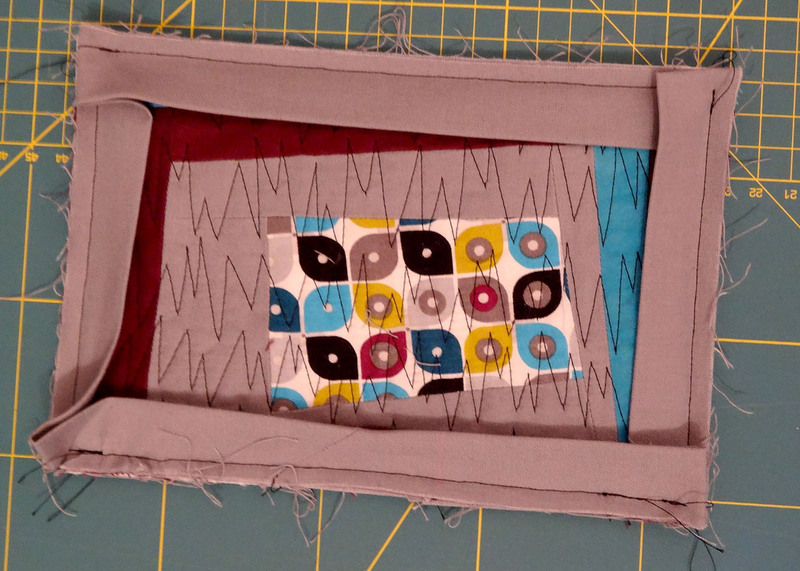 The horizontal part of the binding strip is already stitched to the postcard, but in these pictures the stitches are hidden under the folded back binding strip. Put the needle back into the fabric on the other side of the corner, a ¼ inch away from the edge of the corner, backstitch and sew until you reach the other corner, again stop ¼ inch from the edge and create the second mitered corner. Repeat until you have attached the binding strip to the last corner. 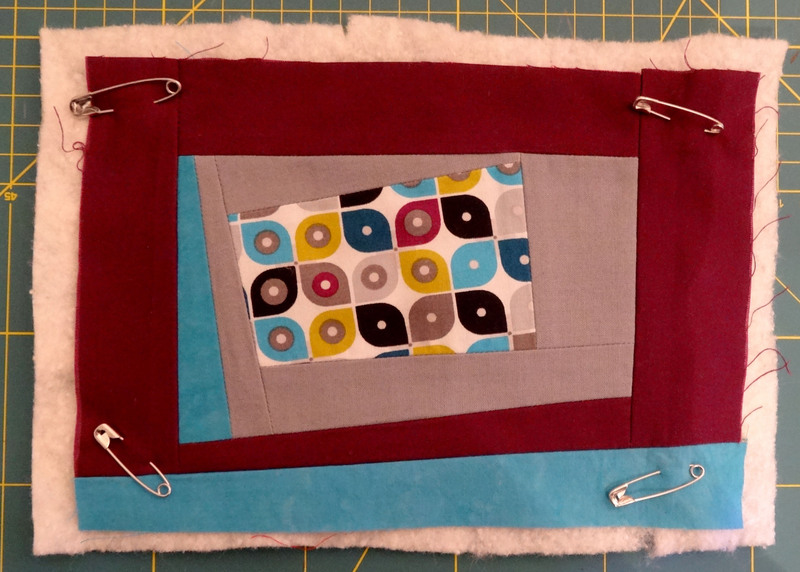 Stop sewing ¾ inch away from the corner so that you are left with a gap. Overlap the two ends of binding so that the shortest end is on top the longer end. Mark where the two ends meet. Use a ruler to measure 2” (the width of the unfolded binding strip) away from the marking that you made and make a 2nd mark. Cut the strip on this second mark. 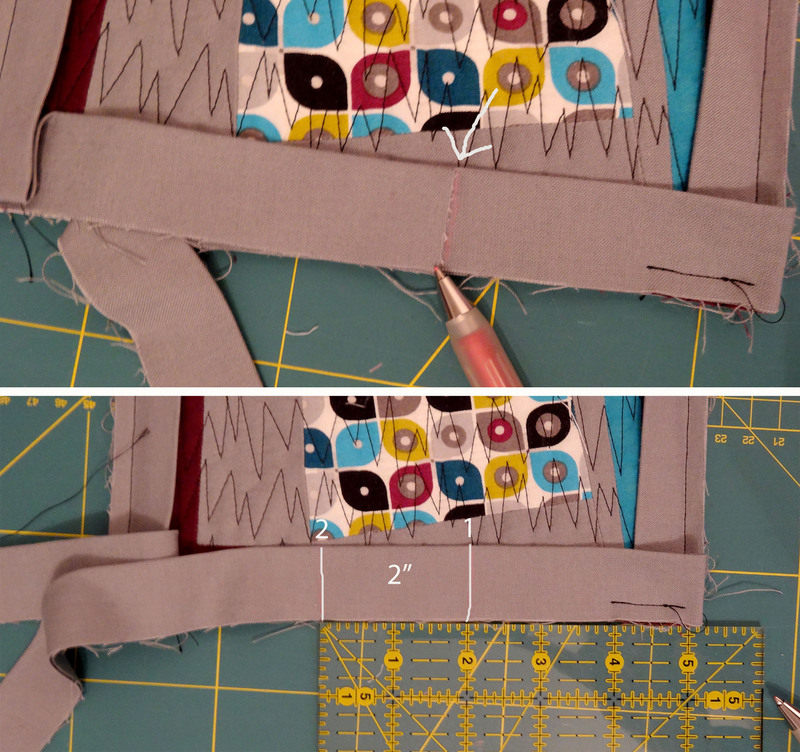 The next picture shows how to place the two ends of unfolded binding to sew the gap closed. If this isn’t clear enough you might want to take a look at the “leave a gap” method in my bias tape tutorial, there the method is explained in more detail. After you have sewn the seam, check whether the the binding fits the gap. If you’re happy cut down the seam allowance and press. Attach the remaining part of the binding to the postcard. Step 8: Handstitch binding in place. 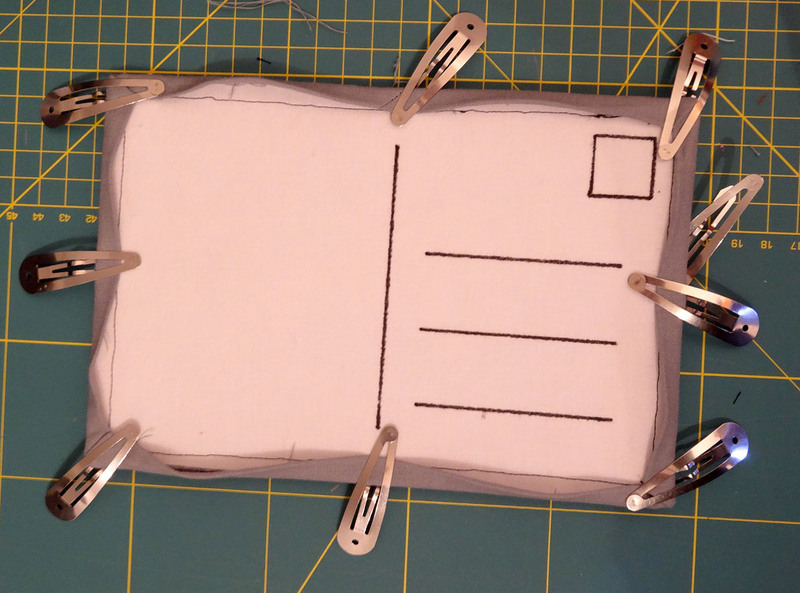 Fold the binding to the back of the postcard and hold in place with quilting clips. 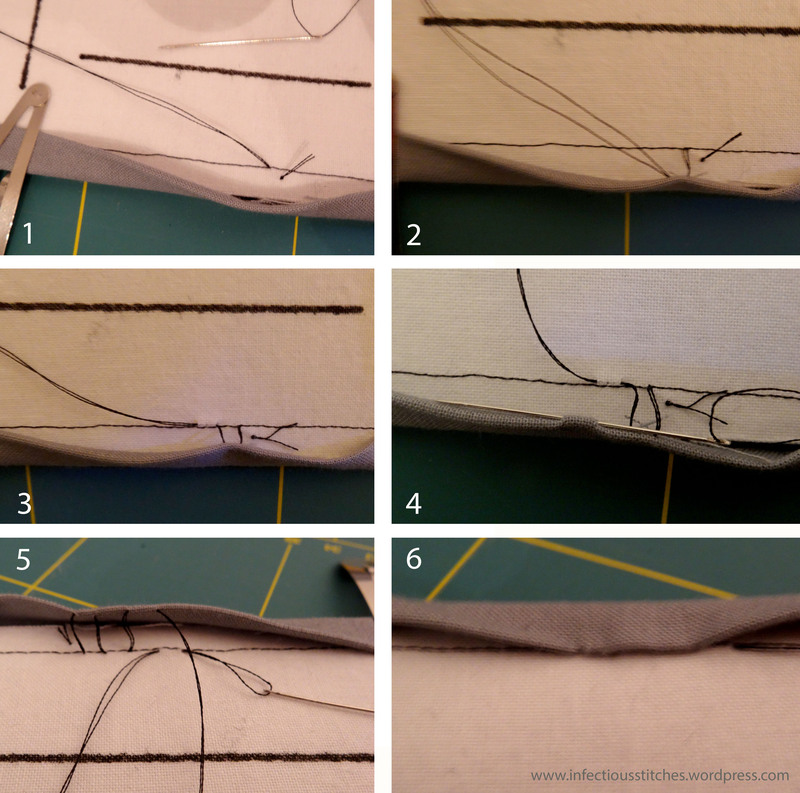 The pictures below show how to stitch the binding in place so that the stitches will be invisible. If this postcard hadn’t been for a tutorial I would have used matching thread. On the postcard side the fabric is very stiff due to the firm interfacing that was used. I simply ignore that there is interfacing and make my stiches only through the white piece of fabric. 1) Use a double thread with a double knot at the end. Insert your needle into the postcard so that the knot will be hidden under the binding and that the needle comes out just outside the stitching line where the binding was attached with the sewing machine. 2) For your second stitch, insert the needle into the edge of the bottom layer of the binding strip. It is important to enter the fabric directly opposite from where the previous stitch ended on the postcard side. 3) For the second stitch insert the needle into the postcard directly opposite from where your stitch ended in the binding. 4) In this picture you can see how I take a stitch through the binding fabric. 5) In this picture you can see how I take a stitch in the postcard side. 6) When the stitches are pulled closed you can’t really tell which colour thread I used. 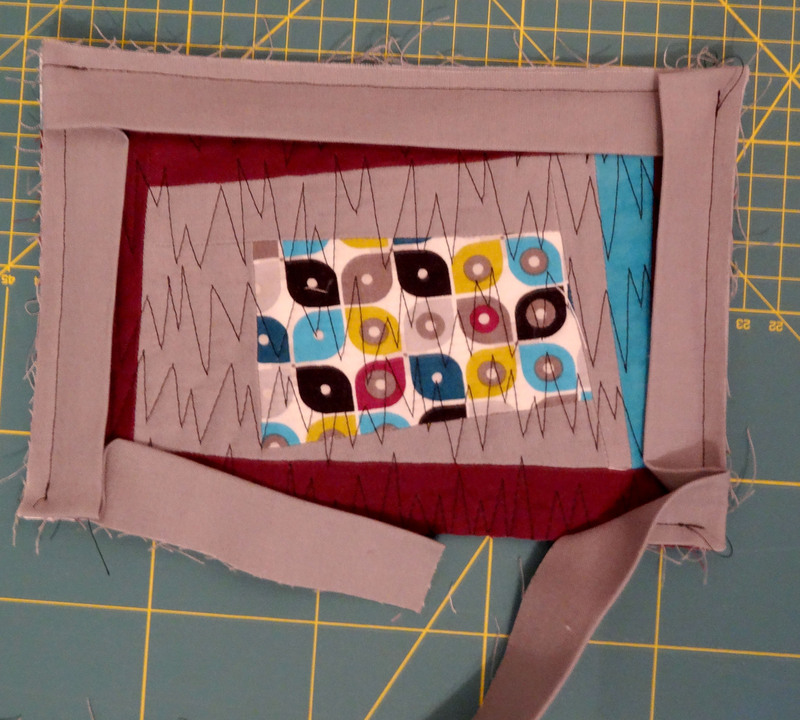 Continue until the entire binding strip is sewn in place. Final step: Write your message, add a stamp and put in the mailbox! Keep in mind that a very large postcard or one with lots of extra’s such as buttons will be heavier; make sure that you put enough postage on your postcard before sending it off! So far, all of my fabric postcards have reached their destination within the Netherlands. I have never sent one of these cards abroad so I can’t say anything about foreign postal services, you’ll just have to give it a try. Dutch stamps are stickers and they adhere very well to the cotton fabric that I have used, if the stamps in your country don’t, you might have to use some glue to make sure they don’t come off. I hope you enjoyed this tutorial and if you make some quilted postcards I would love to see them! If you own a skirt marker you probably use it to mark hems on skirts. 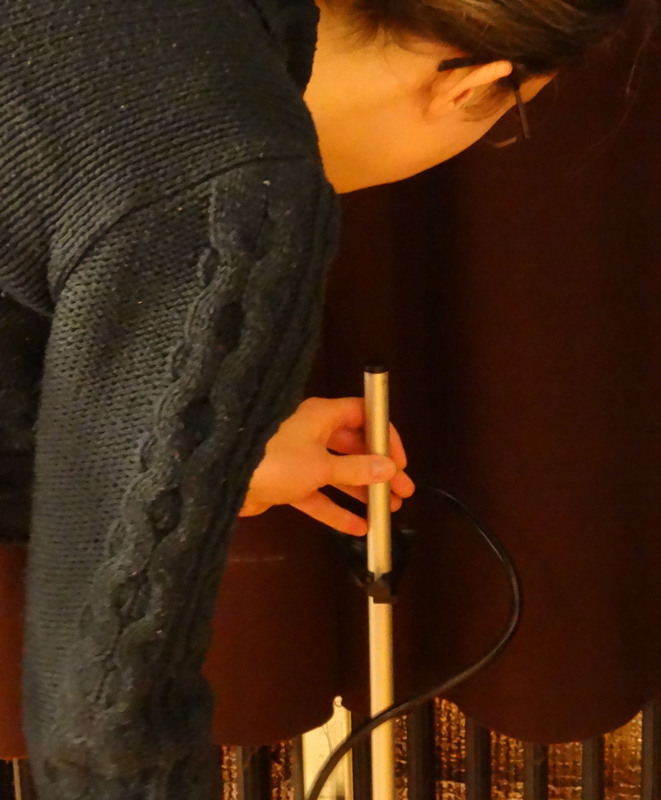 You can, however, also use it to make marks on other items, such as curtains! 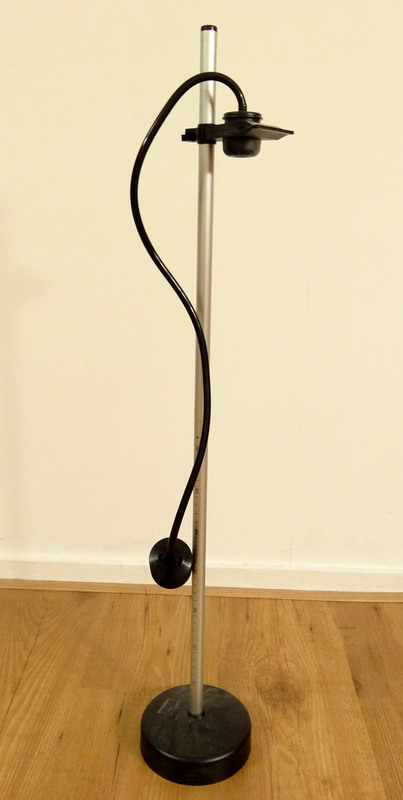 A skirt marker will make it much easier to create an even hem on your curtains. Hang up your unhemmed curtains. 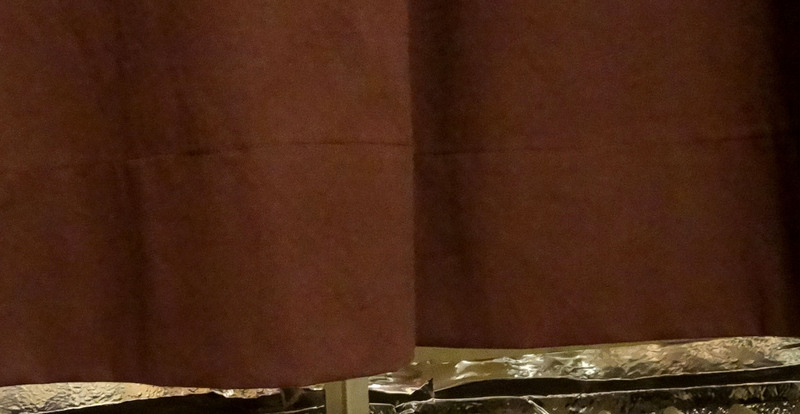 Adjust the height of your skirtmarker to the desired hem height and make marks across the entire width of the curtain. Take the marked curtains down. 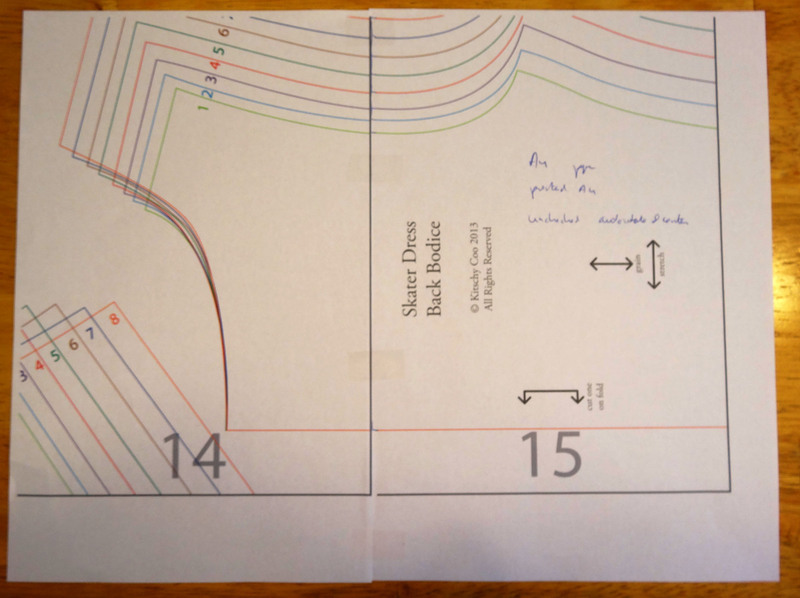 Align a ruler with the chalk markings and use a rotary cutter and cutting mat to add the desired seam allowance. Because curtains are usually large and heavy I placed the cutting mat on the floor instead of a table to prevent the weight of the curtain putting strain on the fabric. My chalk markings are almost invisible here, but I aligned them with the left side of the ruler and cut a 15 cm seam allowance. Sew hem. If you have a lining you can easily repeat this process by hanging up the curtains with the lining side facing the room. Make sure to adjust the skirtmarker so the hem for the lining hits a little bit higher and will end up invisible on the finished curtains. Can you guess what I did during the past couple of days?